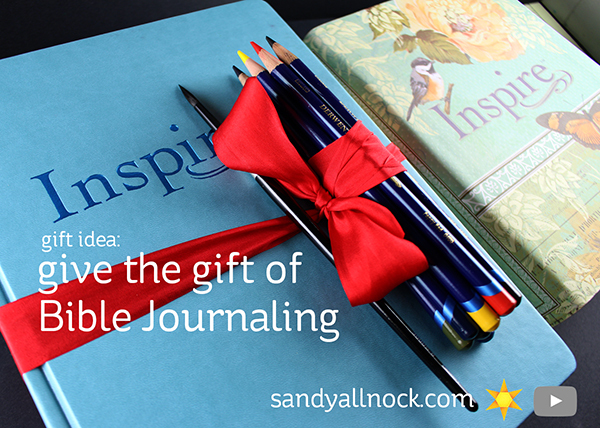 I am hoping this Christmas will see the sharing of Bible Journaling – this year it’s taken off among so many people, and giving others the tools they need to start would be a great gift to give as Christmas morning arrives! Be sure to scroll down to get extra Bible Journaling gift ideas, plus some deals that are available today. Christmas will be here before we know it….and one of the suggestions I have for giving a journaling Bible is one that could take a little time, so I’m sharing early! If you’re sharing Bible journaling with someone who’s never seen it before, it’s especially important to give them an example too—so order in a Bible early enough to be able to complete a page or two for them as a gift in their new Bible. Watch the video below or click HERE to see it in HD on YouTube….then scroll down for links and more. Providing your gift recipient with a “ready to go” Bible journaling adventure will be much appreciated! Here are ideas to complement the gift – and to add to the experience. A letter about YOUR journey in Bible journaling. Just one page, don’t overwhelm them. Use pretty paper with a border or something….and give the person an idea how you started, how it’s changed your walk with God, and if there are tips you have for the medium you’ve provided, list a few of those. You can have more discussion on Facebook later, but give them enough to get started that day if they want to. A medium to color with. It can be a small selection of colors – we who are afflicted with Full Set Syndrome may not think a set of 12 pencils is worth much – but to someone who’s new to Bible journaling, it would be an awesome start! Below I list the Inktense pencils that I love; but if the Bible stole your budget and you can’t afford pricier ones, find a pack of regular pencils (not watercolor) at the dollar store. Just be sure they have something to get them started on Christmas morning! If you choose a watercolor or watercolor pencil set, be sure to TEST it first. (If it’s a dollar store item, you can afford two so theirs can remain packaged!) You don’t want to give them something that’ll bleed through unexpectedly. A brush and/or a mini pack of baby wipes. If providing wipes, be sure to explain how to use them. (Shown in the video above). A devotional. One of my favorites is HERE – and use the coupon code below if you have a dew more things to shop for! You can also look in your local Bible bookstore for a small daily devotional book….sometimes they have small ones for just a few dollars. A mug and/or some favorite tea. Devotional time is a great time to snuggle in with a cup of something tasty. A handmade bookmark. Create one yourself that they can keep in their Bible! A promise. Commit to a weekly visit, phone call, or skype chat to talk about Bible journaling and help them get started. To help you out – I have some deals to share! Dayspring will give my readers $20 off any $60 purchase (plus free shipping!) using coupon code SHINEHISLIGHT at checkout, until December 31. It’s the perfect time to get the beautiful leather Bible that has become my main journaling Bible. Illustrated Faith Ships Free: Use code IFSHIPSFREE to receive free shipping on any Illustrated Faith purchase. Through the end of today Nov 2, they’ve got a sale on Thanksgiving Decor – I just ordered this Wood Caddy for just $10; and you can get this beautiful Give Thanks for $15. Friends & Family Sale: 25% off store wide Nov. 3-6 with code FAMILY. Hello Sandy, I’m looking for a Catholic bible jornal, do you may know where and which one should I get? Thank you so much! Alicia!!! What a lovely gift this would be. Thank you for the inspiration. I love this idea! What a great Christmas gift! I’ve been wanting to start bible journaling but I didn’t know where to start. I was also going to mention that the click “HERE” to see your favorite devotional says page not found….fyi. Sorry! Got it fixed now. Just checking out all the links and the devotional link doesn’t work. I do love the wood caddy!